If you have been following my blog for very long I am sure you have already figured out that I love Doll Quilts, Small Quilts and ALL Little quilts. The smaller the better! 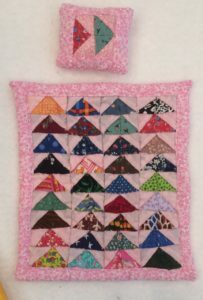 I want to share some Mini Quilts with you today from my collection. I also want to mention that I am happy to do a lecture and trunk show on my little quilts if you happen to be a program director for your quilt guild or if your church is having a Mother/Daughter Tea and needs a special program. I love sharing my passion and my quilts! You can contact me at the email below. This first little treasure from E-Bay has flying geese that measure 1-1/8” x 5/8”. The overall quilt size is 5-7/8” x 6-3/4” and of course it came with a tiny pillow to match. It is even hand quilted in the ditch around each flying goose block. Someone really put a lot of work into it. I love all the bold goose fabrics set in the calm pink. 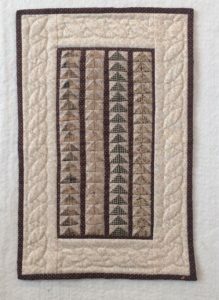 The next one is one of my absolute favorites and it is also a Flying Geese pattern and hand quilted. It measures 9-1/4” x 14” but has 72 exquisite tiny flying geese. It is also signed on the back “Yeoman 1991”. It looks to be hand pieced as well as hand quilted. It took someone a lot of time and patience to make this beauty. I am sure if you have been quilting a few years, you remember when “Rag Quilts” were all the rage. 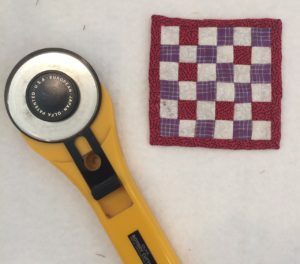 You layered 3 or 4 layers of flannel and stitched them together leaving the seams open on top and then took scissors and cut the seam allowance into little strips. When you washed it, the strips raveled and made a cute little “rag” finish. They made very warm and heavy quilts. My husband loves taking his nap in the winter under the one I made him. This little one (also from E-Bay) came with the bed and three “rag” pillows. 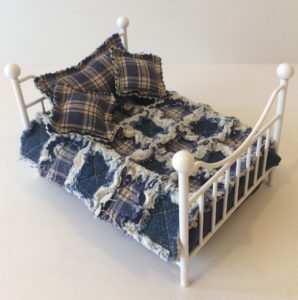 It is so precious and the bed measures only 4-3/4” x 6-1/2”. 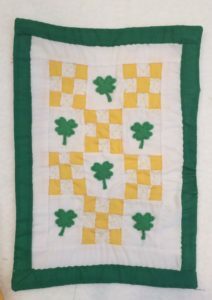 I don’t often find applique in miniature quilts so this one is a special treasure made with a yellow Irish Chain pattern and Green Shamrocks appliqued on the plain blocks. It is also hand quilted even though there is no batting inside. Sometimes even the simplest patterns can make an adorable quilt – especially if they are stitched with love. I wanted to share one more extra mini quilt. It is done in red and purple with white. I photographed it next to my rotary cutter so you can get a sense of the size. It measures 3-1/2” x 3-1/2” with each little block being just 1/2”. All this talk of mini quilts just makes me want to go cut out another little treasure this afternoon. Maybe I will! ← F is for Four Leaf Clovers! Lucky YOU!